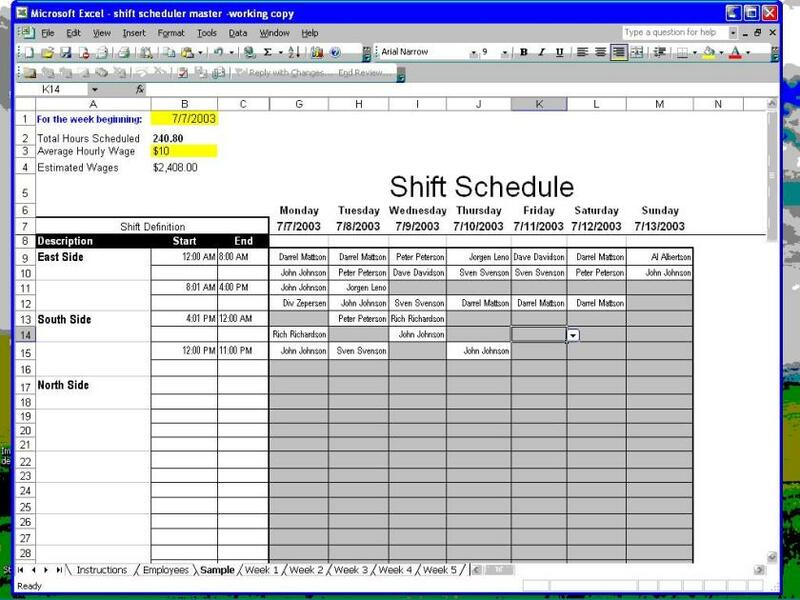 An affordable spreadsheet to help you create professional looking shift schedules in Microsoft Excel. Who should use the Shift Scheduler? Small businesses who are presently creating shift schedules with paper and pen, who do not need the bells and whistles of more expensive scheduling solutions. We do not recommend Shift Scheduler for any business scheduling more than 20 employees. May I try it first? Yes! Click here to download a trial version. 1. The first thing you do is enter the names of the people you will be scheduling. This is done in the workbook named "Employees." 2. Go to the "Week 1" work book. 3. Describe your shifts in column A. 4. In Column B and C, enter the times that the shifts begin and end. 5. Then, click on any grey-colored cell to assign the shift to an employee. Cells that remain grey will be "greyed out" on the printed schedule. The scheduler tracks the number of people-hours that you have scheduled in cell B2. If you enter your average hourly wage in cell B3, the scheduler will provide a ballpark estimate your payroll. Yes! Modify it all you like in Excel. Within 30 minutes of your purchase, we will email you a link to download the unprotected version of the spreadsheet, which you can modify. We recommend you keep a backup copy just in case any mistakes are made. Do you Support this software? We provided very limited email support. We do not coach people on Excel, or give advice on how to make modifications. We will, however, fix attempt to correct any errors that are reported. We are always open for feature suggestions. If you have some simple requests for adjusting the scheduler, we may be able to accommodate you for a small fee.